I Need To Drive Something While I'm Waiting For My Tesla Model 3! What Car Should I Buy? Daniel is one of the thousands of people who plopped down a deposit for the much-hyped and lately production-troubled Tesla Model 3. Well, it looks like it’s going to be awhile before he gets one of his own and needs something cool in the meantime. What car should he buy? I’m about to hit my midlife crisis and I am planning to handle it rationally. I put a day one reservation on a Tesla model 3 with an expected delivery date between November 2017 and January 2018. The key word there is “expected” because who knows how long it’s going to be before Tesla reaches optimal production. I love the idea of instant torque and some of the latest tech in a four-door sedan. I am ready to pull the trigger once my number is called by Tesla but I want to be sure I am getting the best bang for my buck. What other comparably priced four-door entry luxury vehicles are out there that can do 0-60 in 5 sec that are worth owning? I plan on spending about $50,000 so I’d like to see if there is a better value out there over the Tesla. Hey Dan, so despite the current “production hell” problems of the Model 3, I can see the appeal of that car. But the reality is that no one really knows whether or not it’s going to be any good. Sure, the fanboys will love it regardless, but if Tesla is like any other automaker, it may be best to wait a bit so they can work out the bugs. This was definitely the case with the Model S.
The Teslas are quick and high-tech, but with their semi-autonomous features they can blur the line between actually driving a car and being transported by a machine. So before our auto-robot overlords take over, I say experience something visceral. Get a car that is loud, fast and has an attitude. Buddy, you need a Mercedes C63 AMG. This is one of the last German muscle sedans before they started turbocharging everything. Mercedes crammed a 6.2-liter naturally aspirated V8 with 451 horsepower that should easily scoot to 60 in under five seconds. You’re going to miss out on some of the very latest tech, but you have plenty of years ahead of you to experience all that and this may be your last opportunity to drive an old-school sports sedan. There are plenty of these available for under $50,000, including this 2014 model with only 15,000 miles. If you can find a certified car, you will be covered for the next two years with unlimited miles, which means you can lay down some rubber worry-free until Elon figures out how to escape from hell. The good news is that about $50,000 will get you a lot of speed these days, and the sport sedan segment has grown so vast that you have a lot of new and used options. As always, my advice is to drive a lot of different stuff from BMW, Audi, Mercedes, Jaguar, Infiniti and others and decide what you like best. Test drives are key here. One thing Cadillac and Tesla have in common is that it took the former a hot minute to get its tech working right. The first few years with the CUE infotainment system were a hot mess, but lately it works faster and better than ever. This helps make the 464 horsepower Cadillac ATS-V a screaming deal—here’s a new 2017 model for just $56,991. A little above your stated budget, but manageable. And it’s one of the very few cars in this class with a manual gearbox option. You won’t be wanting for torque with this twin-turbo V6. If that’s not your bag, I’d also recommend checking out the Jaguar XE. It turns out you can score a new or recently used one right in your price range with the 340 HP 3.0-liter supercharged V6. It’s not quite my favorite car in this segment, but it has great technology because it’s one of the newer models out there. And it’s something different from the endless sea of BMWs and Audis out there. Try it, you may like it. Daniel, let’s be honest here: you’re a bit of a technology fetishist. That’s okay! I mean, look at what you picked as your mid-life crisis car— a Tesla Model 3. You specified “a lot of technology” in your requirements list there. The problem is, pretty much anything now has “a lot of technology,” so what you really want is something that has that technology at the core of its essence. That’s why you want this Subaru SVX. Of course, with your budget, you can have pretty much any Subaru SVX you want—the link I gave there is for a very nice 1992 SVX for $10 grand, but here’s an immaculate ‘95 for $9000, and there’s more out there. The reason you want an SVX is that there’s few other practical, usable, and reliable cars that express raw techno-futurism quite as exuberantly as the SVX does. Sure, it’s early 1990s tech, but who cares? This thing somehow still feels like the future. 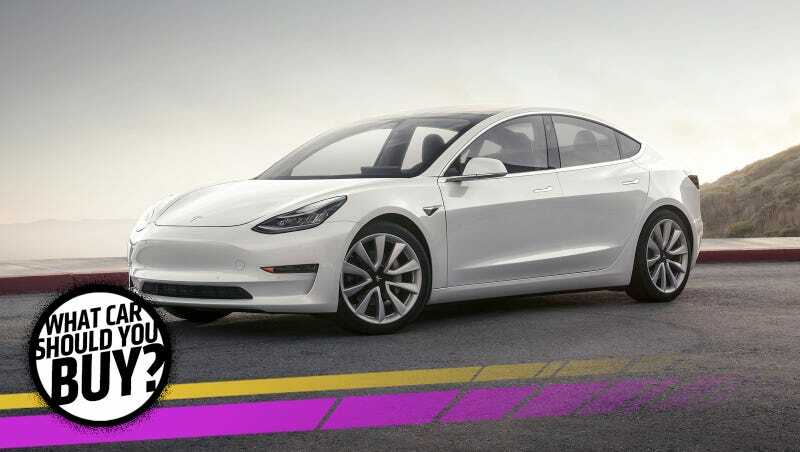 It’s sleek and spaceshippy, it has those incredible windows-within-windows that will wow anyone as much as any pop-out Tesla door handle would. This thing is far, far cooler than even your new Model 3 will be. They were pretty quick, too with the only other flat-6 this side of a Porsche 911 (or a Corvair, sure) you’re likely to see on the road, making a respectable 230 horsepower. The big Achille’s heel of the car was that it only came with a four-speed auto, but with all the cash you’ll have left over you could have a 6-speed manual swapped in, and still come out way ahead. Look, if this is just a stopgap car until that magical day when you get the keys to your Model 3, then why not have some fun, and take a bit of a risk! Plus, you’ll be saving, what 40 grand! Come on! You know what the only thing you should be worried about if/when you get this SVX? Cancelling that Model 3, and making an enemy of Elon Musk. $50,000 buys a lot of car, and two of the suggestions here are solid luxury performers (sorry Jason) but no high-class hot rod is going to match a Tesla’s real practical value proposition, which is carrying on quickly and quietly. Why not dial the rage back a little and check out something that’s more auditorial subdued but still stands out? To that end, I present the Lexus IS 350. It’s a rear-wheel drive (or all, if you must) luxury car close in size to the Model 3 with what I imagine to be plenty of performance for use in polite company. It won’t feel quite as exhilarating as an EV, but it comes in under budget and carries Toyota’s reputation for solid build quality and longevity. Plus, its got some semblance of futurism in its design and you can actually buy one now. Ideally, the IS’s bigger brother the GS, in a sport-hybrid trim, might be more interesting to a Model 3 fan but a new one is a little ways out of your financial reach. Keep your eyes open for a used one? I Need Something Cheap So I Can Learn To Drive Stick! What Car Should I Buy? I Need A Big Family Car That Is Affordable And Eco-Friendly! What Car Should I Buy? I Need A Fast Car That Doesn&apos;t Look Fast! What Car Should I Buy?